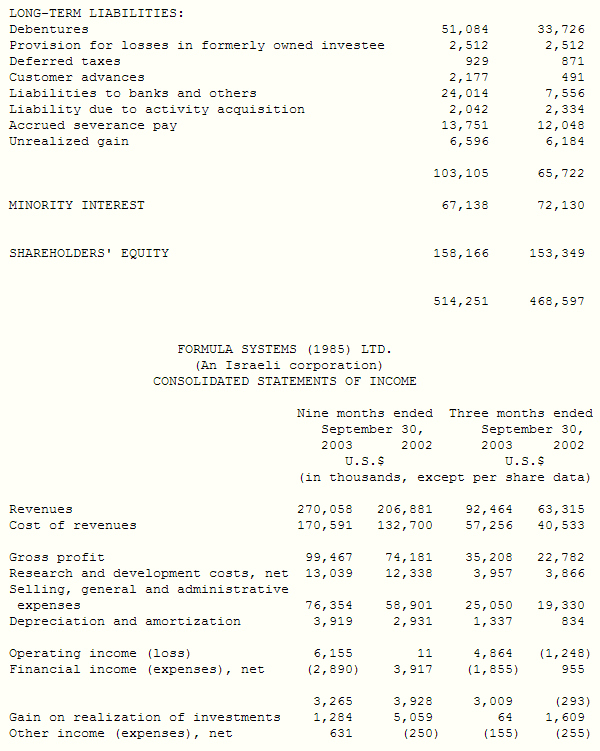 HERZLIYA, Israel, Nov. 13 /PRNewswire-FirstCall/ -- Formula Systems Ltd. (Nasdaq:FORTY - News), a leading provider of information technology products, solutions and services, is pleased to announce its financial results for the third quarter ended September 30, 2003. Revenues in the third quarter of 2003 totaled $92.5 million compared to $63.3 million in the third quarter of 2002, an increase of 46%. In the first three quarters of 2003 revenues increased from $87.7 million in the first quarter to $89.9 million in the second quarter and to $92.5 million in the third quarter. 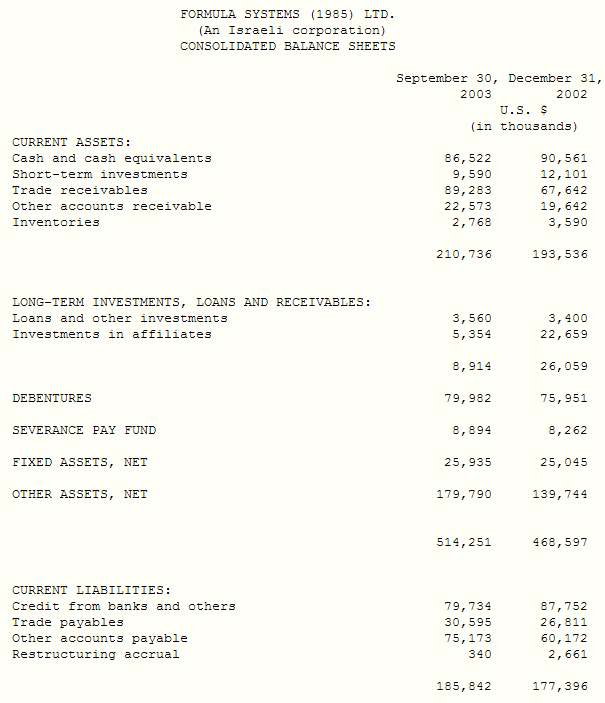 Revenues in the first nine months of 2003 amounted to $270.1 million compared to $206.9 million in the same period last year, an increase of 31%. For the third quarter of 2003 Formula reported operating income of $4.9 million compared to operating loss of $1.2 million in the same period last year. During this year operating income grew from operating loss of $1.0 million in the first quarter to operating income of $2.3 million in the second quarter and to $4.9 million in the third quarter. Net income for the third quarter was $638,000 compared to a net income of $553,000 in the second quarter and net loss of $ 1.0 million in the first quarter of 2003. Sapiens has been able to regain profitability on the strength of continued quarterly improvement in results. Sapiens expect to demonstrate further improvement in revenues and profitability in the fourth quarter of this year and is starting to see the fruits of its long-term strategy. Sapiens's new offering to the insurance industry -- Sapiens INSIGHT(TM) Solutions suite -- is generating a high degree of interest on the part of insurance companies that need to control costs and modernize their systems. Sapiens is gaining market awareness and recognition, expanding their offering and beginning to see new customers joining their established customer base. Sapiens recently announced that it was awarded a further contract with Liverpool Victoria. BluePhoenix's primary goal, profitability, was achieved through increasing sales margins and improving overall efficiency as a result of the reorganization plan implemented in prior quarters. BluePhoenix's next goal is to leverage their suite of cutting edge technologies and integrate them into state-of-the-art modernization solutions. The challenge, therefore, is to increase market awareness of the significant technological advantages offered by BluePhoenix's modernization solutions. Magic has delivered another profitable quarter. Encouraged by the continued signs of momentum and penetration Magic are experiencing with new and existing customers and their growing pipeline, Magic is building the infrastructure and tools needed to enable growth and continued profitability in 2004 with a focus on strategic planning, product development, strict expense monitoring, extensive personnel training and the forging of new partnerships. The results of the quarter continue to support the substantial improvement in Matrix's profitability resulting from the improvement in efficiency subsequent to the merger with its subsidiaries. Matrix is maintaining its strategy of diversifying the structure of its offerings while improving profitability. In Matrix's estimation the significant efforts put into the ongoing efficiency drive will bear fruit in the first quarter of 2004 where they expect higher rates of profitability. nextSource have entered into a partnership agreement with a globally leading HR/compensation consulting firm. The agreement enables nextSource's partner to resell the nextSource "People Ticker". nextSource will provide a privately labeled "the People Ticker" product. The nextSource People Ticker is a real time rate and compensation tool providing HR and procurement organizations direct, temporary and consulting market rates and salary data. Gad Goldstein, President of Formula, commented: "The constant improvement in all relevant parameters in the first three quarters of 2003 proves the benefits of the successful implementation of our efforts, started a year ago, to increase efficiency throughout the group. The ability of the group's companies to translate an increase in a turnover of $2.6 million between the second and third quarters to an increase in operational profit of approximately the same size proves the quality of the foundation we have built. Based on initial data for the fourth quarter we expect the trend that started at the beginning of 2003 to continue and the profit for the fourth quarter to grow. Furthermore we expect full year 2003 results to be substantially better than 2002. After the successful implementation of the reorganization plan that dealt mainly with expenses and the return to a positive cash flow, we foresee 2004 as the year that will bring us back on the path of earnings growth."